Most bloggers use StatCounter for tracking traffic to their websites, blogs etc. While working on our own website, we often visit almost every page numerous times to check whether everything is fine or not. By default, StatCounter tracks these visits as well which are of no use to us. To be able to make better use of the statistics offered by StatCounter, it is important that we get genuine and accurate number of visits counted and recorded. More the accuracy in the number of the visits, more you can tune your website which will result in more traffic in the form of organic visits. In this article, I am going to give you a step by step tutorial on how to create a blocking cookie and prevent StatCounter from recording your own visits to your website. Step 1: Log in to your StatCounter account with which your website is linked. For the purpose of this article, I am taking my Techulator account as my website. After logging in, you will find the page like in the image below. Step 2: Click on the spanner shaped icon i.e. the one encircled in the above image and after clicking on that icon, you will be be redirected to another page like in the image below. 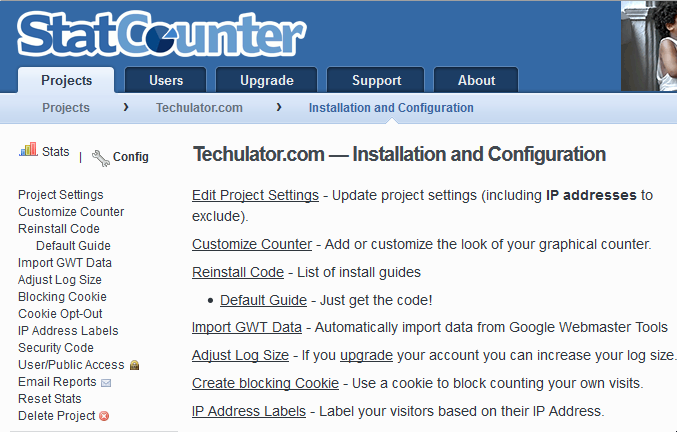 Note: Please click on the spanner icon of the website for which you want StatCounter to create the blocking cookie. If you have more the one projects linked to the StatCounter account, you need to follow this procedure separately for all of them. Step 4: As you can see that a yellow coloured banner is displayed that says there is no blocking cookie set for your project in the above image. This step is just to remind you that you should clear all the cookie and cache data of your data. To do that, go to your browser settings and erase everything except the 'form filling data' otherwise you will be logged out. Note: The above step creates and saves a cookie on your computer that reminds StatCounter to not record the visits made from this computer/browser. If, in case you clear all the cookies on your browser, you will need to create a blocking cookie again. So, don't forget to follow the same procedure again when you clear the browser cache or switch to another browser. By following these easy steps and creating a blocking cookie for your own website, you get much more optimized and efficient statistics for your website. These statistics can then help you take better decisions in terms of content improvement and other promotional reasons. Please consider the notes written in Italic font in the article as they are very important for the successful creation of this blocking cookie. If you have any questions regarding the above process, feel free to ask them in the form of a response to this article below. I will be happy to help you to the best of my knowledge. This is really good information. This will help the user to identifying the exact details of own visits to the particular blog or website and based on that the user can block own visits to the selective blog or website. Great article. But the blocking cookies of StatCounter is not suitable for mobile devices. Even after setting up a blocking cookies for my mobile browser, StatCounter is still showing my own page views. There is no advantage of using it if you are having a mobile device with interrupted network connection. I am using it on Nokia E51, one of the oldest smartphones of Nokia. It is working pretty fine. I think the error lies in the browser. You might be using UC browser or the Spartan browser which do not have reliable cookie generation. You might have observed that you can not use net banking, Paytm or other online secure connections via these browsers because of there are less secure cookies. It is working really good with Opera browser's version v6 and more. So try using the above steps in the Opera browser and see whether the cookie is working fine or not. Yes, I am using UC Browser in my Nokia C3-00 Java based mobile handset. And you are using Nokia E51, which is a Symbian smartphone. That is the difference. As you have said that, when I tried to use the Opera Mini browser in my mobile, it was working perfectly with the blocking cookie of StatCounter. The main issue that i am experiencing with the UC browser is the StatCounter cookies are not being blocked in US browser. Yes, that is what I wanted to say. UC browser is a Chinese browser with less trust rate. So you cannot use the secure cookies on it efficiently.